The LEGO® DIMENSIONS™ Starter Pack has everything you need to set out on epic mash-up adventures filled with iconic worlds and unlikely allies as you’ve never seen them before. Build the minifigure heroes and fire-up the game to start the experience, then follow the in-game build instructions to assemble the loose bricks into the LEGO® Gateway, and place the structure on the LEGO® Toy Pad. There’s a whole multiverse of puzzles to solve, and challenges and enemies to face, and when you’re ready for more, collect level, team & fun packs to expand your collection. Use whatever minifigure with whichever vehicle or gadget – go ahead… break the rules! Price is 77% below the initial Lego retail price, a € 76.90 discount! The DIMENSIONS™ Starter Pack Wii U™ (71174) Lego set is available from the sites below. However, they do not offer delivery to your selected region. The DIMENSIONS™ Starter Pack Wii U™ (71174) Lego set is no longer directly available from the sites below. However, 3rd party partners of these sites might still have the set available. 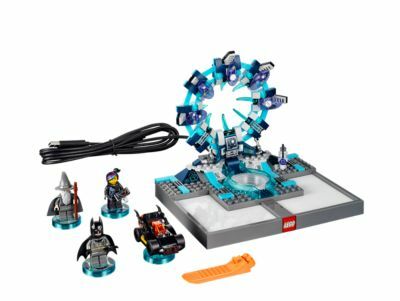 Alternate description Combine building and crazy mash-up gaming with this LEGO® DIMENSIONS™ Starter Pack, including game disc, LEGO Toy Pad with Gateway bricks, 3 minifigures and a 3-in-1 Batmobile.